2018 was another banner year for research at ESO, leading to ESO’s retaining the distinction of being the world’s most productive observatory. ESO’s observatories continue to set the bar for astronomical research, and with 1093 publications in 2018 ESO exceeded the productivity of any other ground- or space-based observatory. The largest contributor to this result was ESO’s flagship facility, the VLT (Very Large Telescope)/VLTI (Very Large Telescope Interferometer) at Paranal. A total of 618 papers were published using data from the VLT in 2018. The most productive instrument this year was UVES with 139 publications, closely followed by X-shooter, MUSE, and FORS2. Other telescopes at Paranal made significant contributions to ESO’s research output in 2018, especially the VST (VLT Survey Telescope) and VISTA (Visible and Infrared Survey Telescope for Astronomy). Data from these facilities contributed to 48 and 105 papers respectively. ESO’s telescopes at La Silla Observatory continued to be productive, contributing data to 236 papers in 2018. The standout facility at La Silla was the exoplanet hunter HARPS, which was responsible for over half of those publications (120). The number of papers based on HARPS data rises each year, indicating its significant impact on the exciting and rapidly developing field of exoplanet research. ALMA and APEX  , in which ESO is an essential partner, also had impressive years. 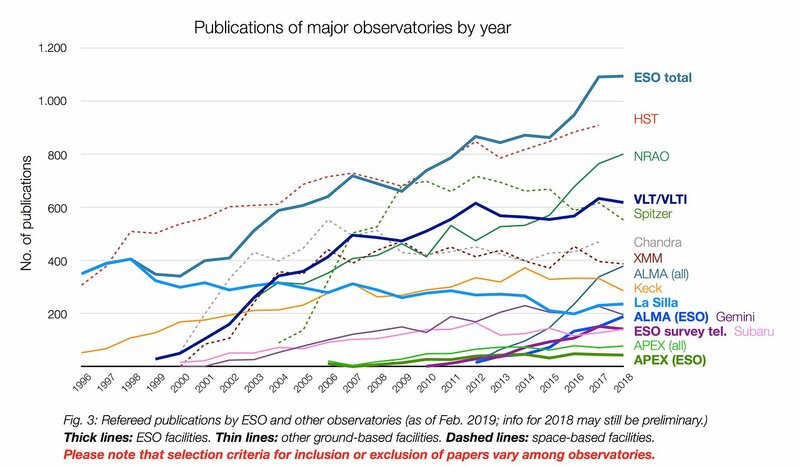 In 2018 the number of papers published based on European observing time at ALMA increased by 24% over 2017, amounting to 189 new papers published. This new research brought the total number of papers based on European observations at ALMA to 650 since the telescope began publishing data in 2012. APEX continues to be a productive observatory — the 78 papers published in 2018 using data from all APEX partners brought the total number of papers published since it began operating in 2006 to 680. When combined, these observations again put ESO at the forefront of astronomical research. Although comparisons can be complicated, as different observatories use different methods to count their research output, ESO remains the world’s most productive observatory. 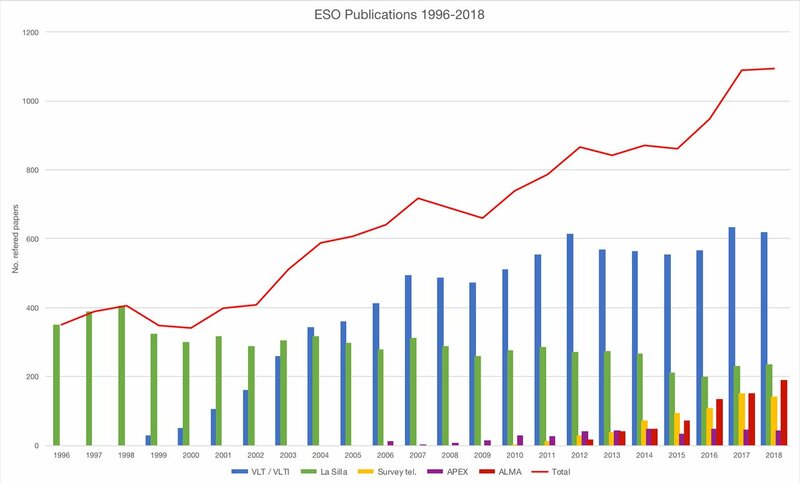 The figures are published in the annual Basic ESO Publication Statistics  published by ESO’s Library and Information Centre and calculated using the ESO Telescope Bibliography (telbib), a database containing refereed publications that use ESO data . ESO makes extensive efforts to identify all refereed papers that use ESO data and considers telbib essentially complete. Interactive graphs of selected statistics are available online . These graphs display the entire content of the telbib database, which contains records for publications from 1996 to the present. They can be used to explore many aspects of the publication history, including the development of science papers using data from ESO instruments and the use of archival data. ALMA is a partnership of ESO, the U.S. National Science Foundation (NSF) and the National Institutes of Natural Sciences (NINS) of Japan in cooperation with the Republic of Chile. ALMA is funded by ESO on behalf of its Member States, by NSF in cooperation with the National Research Council of Canada (NRC) and the National Science Council of Taiwan (NSC) and by NINS in cooperation with the Academia Sinica (AS) in Taiwan and the Korea Astronomy and Space Science Institute (KASI). The ALMA bibliography is maintained jointly by the librarians at ESO and the National Radio Astronomy Observatory (NRAO) as well as by the National Astronomical Observatory of Japan (NAOJ). Publications based on data from all ALMA partners are recorded in telbib, but only those based on ESO observing time are counted in the ESO statistics, unless otherwise noted. APEX is a collaboration between the Max Planck Institute for Radio Astronomy, the Onsala Space Observatory and ESO, and is operated by ESO close to ALMA on the Chajnantor Plateau in Chile’s Atacama region. Publications based on data from all APEX partners are recorded in telbib, but only those based on ESO observing time are counted in the ESO statistics, unless otherwise noted. Telbib information and access to the database.